The 308 Winchester is popular with hunters, police, military and long range target shooters worldwide, and to get the most from this cartridge, you need to know 308 ballistics. In order to consistently hit deer-sized targets at 300 yards and beyond, or determine the best sight settings for long range target shooting, use Shoot! to calculate 308 ballistics. Ballistics chart generated in Shoot! using Hornady 168gr A-MAX Superformance Match factory ammo. Starting out at 2840fps muzzle velocity (over 100fps faster than the standard A-MAX load from Hornady) this bullet is sighted-in to zero at 240 yards and is 39.16″ low at 500 yards. To zero this 308 load for another distance, look at the last column in the ballistics report named ‘Zero Adj’ – this stands for Zero Adjustment (MOA). The number in the column at 500 yards is 7.47 MOA. This means you’ll need to adjust your scope’s elevation turret to come up 7.47 MOA. This will zero the 168gr 308 load at 500 yards. Whitetail sized deer are best taken with a 150gr bullet from Sierra/Swift/Hornady. Such bullets expand easily on soft skinned game like deer and are accurate in most 308′s. At your gun range, setup a target at 100 yards. Now sight-in your 308 to hit the bullseye or center of the target as close as possible. Now adjust your scope’s elevation turret up 2.61 inches (e.g. 1/4″ MOA scope would be about 10 clicks up since 4 clicks at 100 yards is 1 inch). Check where the bullet impacts on the target at 100 yards. If its close to 2.6 inches then your 308 is now zeroed for 230 yards. 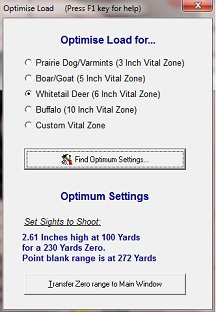 Example – you can hit the 6 inch vital zone typical of a whitetail deer all the way out to 272 yards without holding high (above the animal) or low – you just aim at the vitals and squeeze the trigger on your 308. You can calculate this ballistics data and more for your favorite 308 loads by downloading Shoot! ballistics software today. Experiment With 308 Ballistics Using Shoot! Shoot! ballistics software makes it easy to experiment with different bullets at various velocities and distances and watch the result on a scaled target (just like you were shooting at the range). There are 100′s of 308 bullets to choose in the ammo/bullet database from all the major manufacturers. The ballistics you get from this program is as accurate as the information you input. Download Shoot! ballistics software and start calculating 308 ballistics.